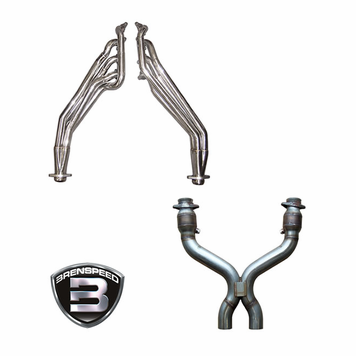 There are already other longtube headers available for the 2011 Mustang. Pypes could have easily followed the flock and created a standard header with mediocre horse-power gains. But that's not their style. Pypes chose to take it up a notch. Pypes 2011 Mustang longtube headers may not look like the other longtube headers out there but after you feel the performance, you won't mind one bit. The Pypes team though out of the box when they set out to design a header system to take advantage of the awesome power that Ford engineered into these cars. What Pypes came up with is "Tube Step Technology" to increase exhaust gas scavenging that, according to Pypes testing, netted 45hp and 19tq to the wheels! 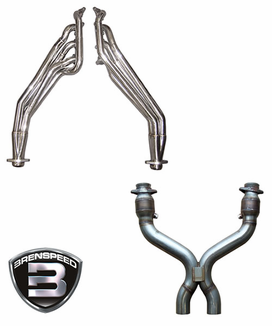 Constructed of mandrel bent 304 stainless steel the primary tubes start off at 1 3/4 and then step to 1 7/8 and finish with a 3" ball socket collector for excellent sealing. The kit includes a full 3" 409 stainless steel x-pipe with twin metallic substrate cats and all the hardware to install, including gaskets and (1) O2 extension harness.